Hoplophobes, due to willful ignorance and fueled by recent emotionally-wrenching news, can do little more than regurgitate what’s been fed to them by the media and politicians. Rather than looking into the real cause of violence, they reflexively ask, “Why does anyone need an AR-15?” In reality, the question is more of a statement. And, they don’t want to hear an answer. Their minds are usually made up (by others). Years ago, I might have asked the same question. At one time, I hallucinated that if we “banned all guns,” it would end crime. I’ve grown older (and I hope wiser) since then, and I decided to educate myself. I’ve realized that the utopian notion of ridding the world of all guns is as likely as banning air. I’ve also delved deeply into the history of the founding of our country and our Constitution. But, that’s not the subject of this essay. Rather, I wish to elaborate on my answer to the question in the title. I’ve learned a fair bit about the technical aspects of modern small arms. I believe that if anyone wants to opine, dictate, or vote on any issue, he or she should be well-versed on the technicalities of that issue. Imagine if someone wanted to make new rules for football without knowing the game. Suggesting that the AR-15 or similar rifles should be banned as “assault weapons,” is akin to suggesting, “We should move the ‘free throw line’ to 25 feet for football games.” It’s gibberish that reveals an abject lack of knowledge of the game or topic. The AR-15 (along with other rifles incorrectly designated as “assault weapons”) is functionally identical to a traditional rifle with polished walnut wood stocks and a blued barrel. The only differences are cosmetic. The correct term for the AR-15 and similar guns is “modern sporting rifle.” These rifles are typically black in color and have plastic stocks instead of wood. They also typically have accessory rails for mounting things like flashlights, lasers, and optics (scopes). Mind you, the same thing could be done with a traditional rifle with a few tools or even duct tape. The joke among gun enthusiasts is to call these rifles “EBRs” (evil black rifles). Some consider them “Barbie dolls for men.” No matter how we dress up these rifles, they continue to function identically to any other traditional semi-auto rifle, such as those used for various firearms activities. To further mock the naivete of the gun-grabbers, many gun forums have a section called, “Black Rifles,” where they discuss modern sporting rifles. Both of these rifles function identically. The only differences are cosmetic. 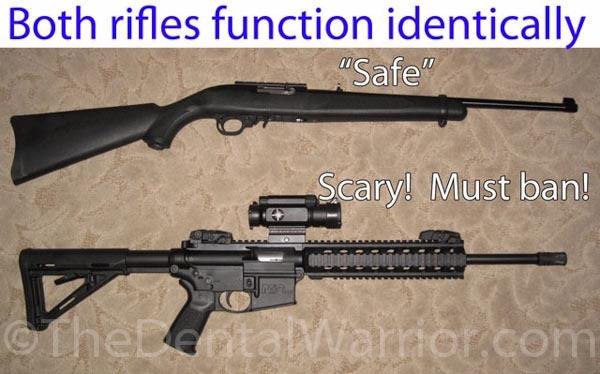 But, some people call the one on the bottom an “assault rifle” because of its looks. The media, politicians, and those they influence often refer to the AR-15 as an “automatic rifle.” It is my belief that the conflation of semi-auto and automatic is not an innocent accident. To be clear… the AR-15 is a semi-auto rifle. That means it fires one round per trigger pull. It is NOT an “automatic” rifle. The military version, the M-16, is a true “select-fire” rifle. That means it can be fired in semi-auto or full-auto modes. Automatic rifles are machine guns. Pressing in their emotional arguments, the gun-grabbers describe the AR15 as a “weapon of war that only belongs on the battlefield.” The fact is that the semi-auto AR15 is NOT used by our armed forces. It is not a battle gun. It is not an “assault rifle.” The AR-15 is a semi-auto-ONLY rifle. Got it? So, to get back to the burning question at hand: “Why does anyone need an AR-15?” First, a hallmark of being a red-blooded, materialistic, capitalistic American is that we own many things we don’t absolutely “need” by the strict definition of “need.” We don’t need a lot of things. But, if there’s one thing I don’t need… it is to justify ANY of my possessions to others who hold no purview or authority over my life. We don’t have a “Bill of Needs.” But, we DO have a Bill of Rights! AR-15s… What are they good for? Absolutely something. At the 300-yard range. Fun! Several people have suggested to me that an AR-15 is not suitable for hunting nor self-defense. I’m not a hunter, and I reject hunting as the commonly used litmus test for gun ownership. The 2nd Amendment is not about hunting. Dammit… I digressed again. As for self-defense, there are many experts who agree that the AR-15 is, indeed, suitable for self-defense in some scenarios. While handguns offer some advantages, they are a compromise, and especially when it comes to “stopping power.” The AR-15 is currently the most popular rifle in the United States for good reason. The AR-15 is an ergonomic and versatile rifle that is lightweight and maneuverable in tight spaces. It can easily accept mounted accessories like flashlights and lasers that can be helpful in bump-in-the-night situations. An AR-15 is accurate and delivers more punch than any handgun. 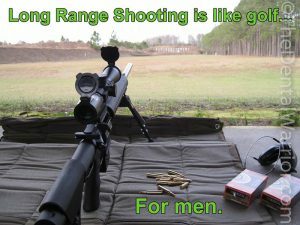 It’s more precise than a shotgun. 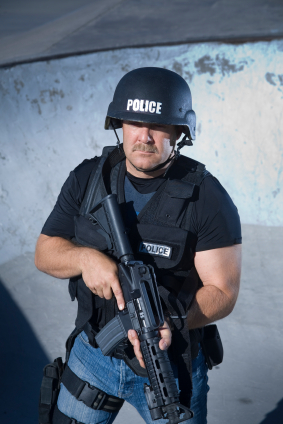 Click here to read about how the 15 year old son of a police officer, who was home along watching over his little sister, defended himself and his sister with dad’s AR-15. I am not suggesting that the AR-15 is the “ideal” home defense gun. There is no ideal home defense gun. Each type of gun offers advantages and disadvantages. My point is that the AR-15 is among those that may logically be chosen as a self-defense gun in certain situations. Consider what you’ve seen on the news many times. When police respond to a location with a bad guy, which type of gun do they often have in their hands? Why do THEY choose the AR-15? If the police have deemed the AR-15 a suitable self-defense weapon, logically it may be equally suitable for law-abiding citizens. Their bad guys are no different than our bad guys. If a bad guy breaks into your home, you can’t wait for the police to arrive with their AR-15s. So, citizens rightfully may choose to have their own AR-15s. 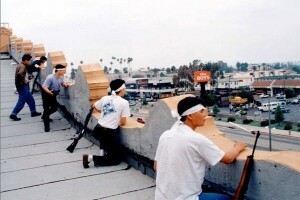 During the Rodney King riots in Los Angeles, there was a section of town where Koreans owned a number of retail stores. The ONLY stores that did not get looted were the ones guarded by their owners, armed with modern sporting rifles. I have an AR-15 because I want one. I hope I never actually “need” it (or any other gun). Why did you get an AR-15? Chime in below! UPDATE: Because of this article, I got interviewed by CNBC! This entry was posted in Editor's Favorites, Guns & Knives and tagged AR-15, firearms, self-defense. Bookmark the permalink. Merry Christmas to you and your family. See you in a couple of months in Vegas at DT meeting. My 12 year old son and I enjoy shooting our bushmaster carbine. Hope we never have to use it for home defense. I would rather have it and not need it than need it and not have it. I love your example of the Korean store owners. That is exactly why people need an “assault” weapon and high capacity magazines Nancy Pelosi. Thanks for chiming in. The Koreans are a great example, I agree. It may seem like I’m being pedantic or getting caught up in semantics. But, I believe terminology used in this discussion should be accurate. If we adopt THEIR incorrect terminology, we are unwittingly advancing THEIR cause, which is to disarm us completely. An older article but VERY relevant in 2018 and beyond because statists will NEVER stop until America is disarmed. The question was “why did [I] get an AR-15?” I never even really wanted one as I used to have multiple other more “powerful” rifles that were lost in an unfortunate boating accident. The initial reason I got one or 6 was that some people who obviously know more than me and who care about me deeply as an individual, started saying they were going to ban them. Well, given my penchant for doing what I’m told I can’t do, I got one..unfortunately it was during the gun and ammo rush of a few years ago. It was a build, not already assembled…as my other ones were (damn boat)! So yeah, don’t threaten me with “we’re going to ban ____” because I may just get 1…or 17!